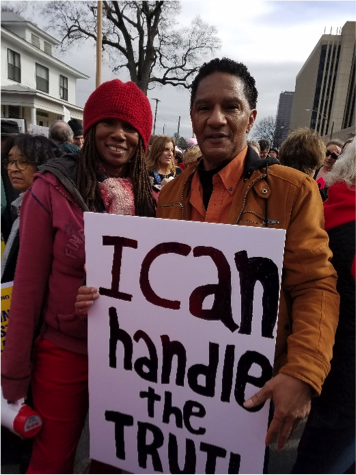 Arkansas women and men came from all over the state to take part in this year’s March On the Polls in front of the capitol in Little Rock, Saturday. The event was sponsored by March On, Arkansas!, a new grassroots organization that, “is committed to dismantling systems of oppression by amplifying the message of groups practicing non-violent resistance and by promoting Arkansas candidates who support a pro-women platform and are also underrepresented individuals,” according to the group’s Facebook page. The group is lead by congressional hopeful, Gwen Combs. 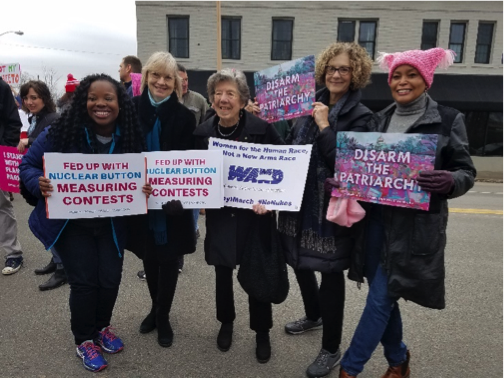 Many of this year’s women political candidates and current legislators participated in the march, and several addressed the waiting crowd. Nancy Docketer from Saline County. Says she came to the march because she’s a proud Democrat. Arkansas State Senate 35th District. Two sitting members of Arkansas’s legislature also spoke before the march. Arkansas Senator Joyce Elliott, D-Little Rock , and Arkansas Representative Vivian Flowers, D-Pine Bluff. Both women will be defending their seats in Arkansas’s legislature later this year. From the corner of South Pulaski Street and West Capitol Avenue, the participants began the three-block march, ending at the capitol building steps. Marthella Johnson and Kevin Craighead said they just moved here from Detroit, Mich. and came to Little Rock to take part in the march. On the steps of the capitol, the marchers kicked off the 8th Annual Rally for Women’s Reproductive Rights, hosted by the Arkansas Coalition for Reproductive Justice. The crowd heard from several women speakers who touched on subjects such as sexual assault, saving the public school system, and immigration/DACA issues just to name a few. According to the rally’s host, Kendra Johnson of the Human Rights Campaign, McFarland lives with a severe form of an incurable genetic disorder. McFarland spoke about her own sexual assault and the rights of women in need of reproductive healthcare initiatives. Perhaps the most profound moment during the rally was when speaker, DREAMer Diana Pancheco, came to the lectern to recount her childhood as an undocumented immigrant in the United States and the benefits she’s received from being a DACA recipient. Pancheco recounted that her father left her in the care of friends who brought her to America and enrolled her in an American school. She is now a 20-year-old student at Philander Smith College, working three jobs and earning her degree in Business Administration and Hospitality Management, as a result of being a recipient of DACA. The rally ended with remarks from keynote speaker, Dr. Anika Whitfield of the organization Save Our Schools. She began her speech encouraging members of Save Our Schools, women and children of color, anyone with disabilities, Dreamers, and people from the LGBTQ community to join her up on her platform. “This is not just my voice, this is OUR voice,” Whitfield said, as people joined her in front of the crowd. Whitfield outlined the tragedy, according to SOS, of public schools closing in Little Rock and negatively affecting the children who are misplaced by those school closings. She expressed to the crowd the importance of people stepping up to reclaim and save our schools and communities. Throughout the day’s events, all speakers spoke to empower women to find their voices and to use them to fight being disregarded. According to promoters, the event had approximately 3,000 attendants. 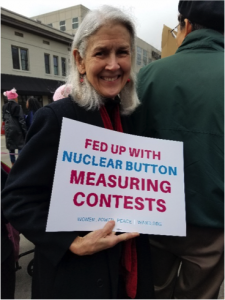 Even though the number of marchers in Little Rock this weekend were less than half of last year’s historical Women’s March, Gwen Combs was remained optimistic. 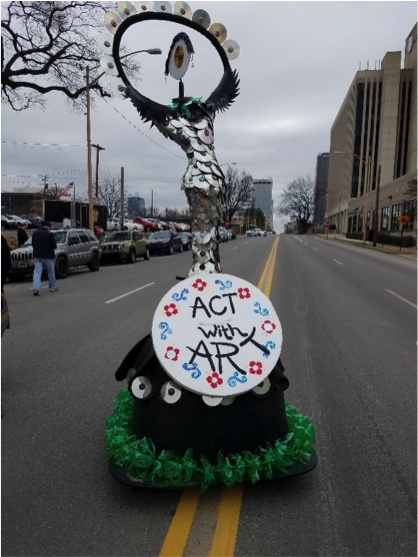 “Goddess of Goodness” Sculpture/Float made by Alice Guffey Miller of Imaginations at Large art studio based in Hot Springs, Arkansas. “For that many people to show up and stand in solidarity a year in, shows there is still tremendous energy,” Combs said. According to Combs, March On, Arkansas! is a subsidiary of March On!, a nationwide movement determined to encourage more women to sign up to vote and become involved in their local politics. Combs said approximately 22,000 women have come forth in the last year to run for office. Prior to the marches, the numbers each year were generally under 1,000.